My short story Jellyfish Moon appears in Issue #67 of Cemetery Dance Magazine with a cover date of August 2012. I just checked the Cemetery Dance Magazine shop on their website and noticed that the issue is sold out. I have some copies of the magazine that I take with me to events, readings, and signings. So if you are a collector or just looking for the story and can not find it please feel free to get in touch. I will be bringing a few copies to a reading and signing planned for later in 2015 and should have some available at the World Fantasy Convention in Saratoga. Also I plan on making an announcement sometime this year about where you will be able to find the story again. 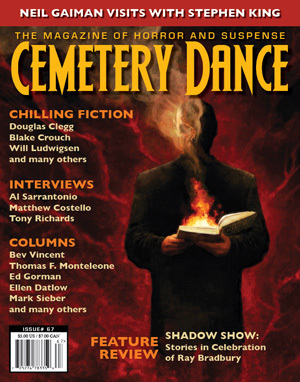 Two of my stories appear in previous issues of Cemetery Dance. The Green Man of Punta Cabre in Issue #71 and Across the Darien Gap in Issue #54. I am grateful to Richard, Brian, Norman and the entire Cemetery Dance team.